Smiling, Rebecca Mock shows students her influences early in her career. She gave students ideas on how to develop their own individual styles as artists, and how to work past any obstacles. “She kept on telling us to keep trying. Even if you present work to someone who rejects it, eventually someone will take it,” Sydney Williams, eighth grade visual major said. 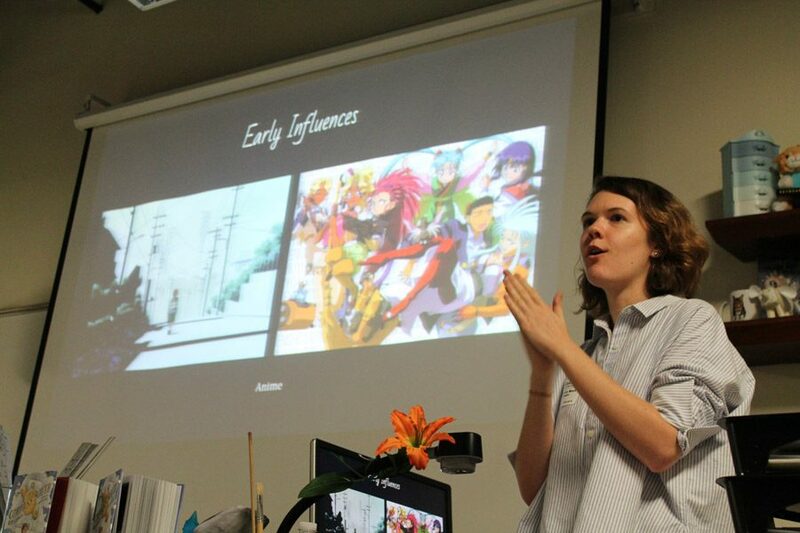 Former Bak visual arts student Rebecca Mock visited the school to speak to students on the visual arts career field. Mock, who graduated Bak in 2003, was also a former student of Stephanie Chesler, visual arts teacher. “[Mock’s success] makes me feel fantastic. It gives me a lot of self-satisfaction to see someone like her,” Chesler said. She also showed some of her own work to students, giving them inspiration. Her success was not only about her career, but also about her passion.